I happened upon this book when I was looking for materials for one of my teachers, and its title was too startling to walk away without picking it up. 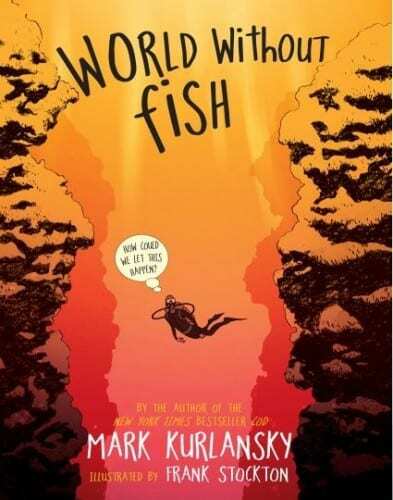 Bestselling author of Cod and former commercial fisherman, Mark Kurlansky, seems to be desperate. He has seen into the future, and the picture he sees is a bleak one. According to Kurlansky, if our [fishing, polluting, eating] habits don’t change quickly, the most commonly eaten fish in our world could be extinct in the next 50 years, which would completely alter the life of our planet. And how do we solve this problem? Kurlansky’s answer: appeal to the youth, the ones that may actually be able to do something about it. I admire his approach — conversational tone, troubling anecdotal evidence, engaging fonts and structure, a related comic between each chapter, and concrete ideas for working for change. He covers the topic from all angles, and although his opinion is never unclear, he objectively portrays the problem at hand. It’s the kind of informational text I’d love to give to science teachers to bolster their curriculum. HOWEVER. Kurlansky fails on one major front that, as a research teacher and information specialist, I’m having a hard time over-looking. He does not cite a single source, offer a resource list or bibliography, and often uses phrases such as, “Scientists think that…” I’m sorry, Mr. Kurlansky, what scientists? All scientists? Let’s be a little more specific, shall we? How can I hand this book to students as an informational text when it fails to show them an example of what we want them to do in their writing? I don’t need footnotes or even full in-text citations, but I would like to see him giving a little credit to his sources. I found myself questioning his somewhat wild claims (however true they might be) simply because I have no idea where he got his information. And this doesn’t help his cause at all. I am still really tempted to buy a copy for my collection though.